LU | What Does LU Mean? LU means "Love You". It is typically used for brevity by people in a well established relationship who regularly say "I Love You". Of note, LU is one of the shortest ways of expressing love for someone and has become widely used in instant messaging or texting to save time. Be aware that LU can be used more informally to convey affection, rather than actual love. It should not be used to tell someone you love them for the first time (or during the early stages of a relationship) because it may not come across as heartfelt. LU is one of the shortest ways of saying "I Love You". Person A: I will meet you at 7pm at the cinema. LU. Person B: Ok. I can't wait. LU2. Person B: What does that mean? Person A: I love you. Person B: Well, that is more like it! Say it like you mean it! 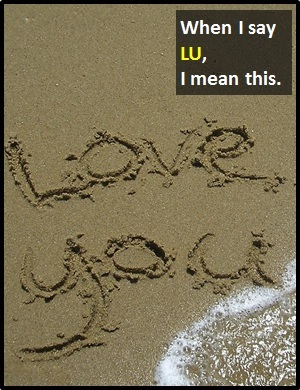 LU is a standalone declarative sentence (i.e., a statement) meaning "I love you". Of note, LU is an initialism abbreviation. Technically, this means it is pronounced using its individual letters (i.e., Ell Yu), but as this is harder to say than "I love you," it is not often uttered using its letters. In other words, the abbreviation LU is for efficiency in writing and not efficiency in speech. Before the digital era, we would have just said "I love you" instead of LU.